I honestly can't remember where this article was published. It was published somewhere though. Was it AOL.com? Fuel.TV maybe? USA Today? Who knows. For someone living in the San Francisco Bay Area, this could be a fun adventure if you've never done it. The following is a story I wrote about a day around the Bay. In all my years of living in the Bay Area (born in Novato, grew up in the East Bay, lived in San Francisco at this point for seven years), I never actually made a complete trek around the whole thing. Meaning, I never started at a specific point, and drove around the entire bay, ending up in the same point where I started. That is, until yesterday. I actually did it. Went around the entire bay in an entire day (that rhymes). And I realized early in this little adventure of mine that if you travel in a clockwise fashion, you don't have to pay any bridge tolls! 10 AM: Leave my apartment at Walnut Creek (where I spent five miserable months, I don't recommend living in Walnut Creek to anyone). Hence, the starting (and ending) point. Head south through Danville, Pleasanton, then Fremont, crossing over from the 680 to the 880, and ending up in Santa Clara. South Bay conquered. I had to do some work at 49ers headquarters, and got to watch a practice session while doing some engineering work. Noon: Leave 49er headquarters. Destination: Bolinas. 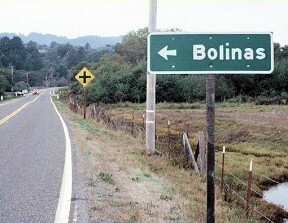 For those of you wondering where the hell Bolinas is, I'll tell you. It's one of the most obscure and hidden cities in the Bay Area. I started my trek from Santa Clara driving up the 101 North. Along the way I saw a car on its side on the other side of the freeway, with miles upon miles of traffic backed up because of it. I felt so lucky to not be stuck in that traffic jam. Poor souls. Anyways, I pass through San Francisco, cross the Golden Gate Bridge, and then got on the 1, heading towards Stinson Beach. "Restricting development and taking down road signs was an effective way to keep Bolinas off the map into the early 90s. But in the age of MapQuest and million-dollar remodels, it isn't enough. Bolinas has been changing into what you might expect of a beach town just an hour away from San Francisco. The changes have created mixed feelings for the local community. For some carpenters, real estate agents, and local businesses, the changes have created new opportunities. But it has also become more difficult for free-thinking artists and idealists to survive, and the town has certainly lost some of the isolation that first attracted them." So after the windy 45-minute drive to get to Stinson Beach (with breathtaking views, mind you) plus the additional 15 minutes to get to the eclectic hippy commune of Bolinas, I arrived at my destination. 2 PM: Oh yeah, the reason for my trip here. It supposedly has a nice break suitable more for longboarding. I read that there was a nasty and large north swell currently hitting the coast, and I wanted somewhere with a little more mellowness to it. So I decided to check out Brighton Beach. It was OK. Nothing crazy. Caught a few decent waves. Met a cool Brazilian out in the water named Juanna who sucked at surfing but excelled at conversation. You have to paddle really hard to catch waves there, took me a while to realize that. I also realized that the time change really blows when it comes to surfing. Nothing like being out in the water after 7 pm, watching a sunset with warmth baking your face. Now? It's 4 pm, it's cold, and it's getting dark (although the sunset was amazing). 4:30 PM: After surfing, I checked out the little town square of Bolinas. Very quaint. Digged it a lot actually. Went to the only bar in town, a hotel/saloon called Smiley's Saloon. Had two Irish Coffees and a Corona, with a very surly and sassy bartender (was her name Emily? Erica? Damn, can't remember), making the experience even more pleasurable. Met a couple of locals, a few people my age (more likely a little younger) from New Jersey and Ohio who were hiking Muir Woods nearby and stopped in for a couple of beers. Got my buzz on. 5:30 PM: Drove back through Stinson to the 101, headed North, crossed over the Richmond/San Rafael bridge (no toll! ), through Bezerkeley, and home to Walnut Creek. 7 PM: The complete trip around the Bay, all in one day.